Nu Metro’s fabulous 'Girls’ Night Out' returns with the talented Taraji P Henson as Ali Davis in 'What Men Want'. She has the power to hear men’s saucy inner thoughts and she is about to the change the game. 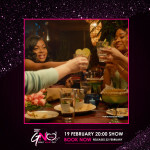 Be sure to be a part of this spectacular night with your girlfriends.